A melting pot of styles and sounds, glorious songs and dancefloor bombs, multi-instrumentalist Flevans' third album sees him going totally sample-free and taking the plunge into full live instrumentation, with stunning results. 27 Devils is laden with irresistible hooks and dotted with charismatic vocal performances from guest stars Sarah Scott and Shona Foster, and Flevans himself. A melting pot of styles and sounds, glorious songs and dancefloor bombs, multi-instrumentalist Flevans' third album sees him going totally sample-free and taking the plunge into full live instrumentation, with stunning results. '27 Devils' is laden with irresistible hooks and dotted with charismatic vocal performances from guest stars Sarah Scott and Shona Foster, and Flevans himself. 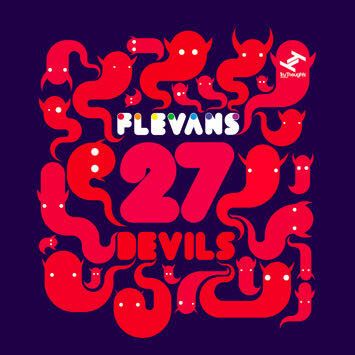 '27 Devils', an album alive with contrasts and surprises of the sonic variety, also occupies a paradoxical territory in Flevans' career, representing a giant leap forward in creativity but also a revisiting of roots and a sense of homecoming in more figurative terms, as Flevans was originally one of the first artists on the Tru Thoughts roster way back in the early days. Attracting the label's attention initially through his innate dancefloor sensibility and talent for a tasty hook, combined with an unabashed use of eccentric and quirky samples, he produced a series of dancefloor-delighting 12"s between 2001 and 2004, which brought him considerable attention and culminated in the well-received 2004 album 'Make New Friends'. Now, having spent the intervening years DJing at some of the world's best parties including Turntables on the Hudson, the MTV Cannes Film Festival Party and The Big Chill - not to mention releasing his second album, 'Unfabulous', on Jack To Phono records in 2007 - Flevans finds himself back in the Tru Thoughts stable with a new three album deal in his pocket and by far his most accomplished work to date on the horizon. As a multi-skilled musician who plays guitar, bass and piano among other instruments, Flevans had always incorporated some of his playing skills into his music, but until recently did not fully explore his potential, relying on that trusty cut and paste basis for his previous records. In 2008, ready for a new challenge, he lent his bass playing skills to acclaimed Brighton band Backini with whom he played at Glastonbury Festival, laid down a Maida Vale session for Rob da Bank (BBC Radio 1) and recorded an album at Abbey Road Studios. His experiences in the band re-ignited his love for the buzz of playing live. Running with this inspiration, Flevans took the bold decision to liberate himself from the several thousand-strong collection of records which he had lovingly collected and on which he had relied for themes and beats in the past, opting to go it alone and exercise the full reaches of his considerable talent. Composing and playing every note on '27 Devils' himself, he ventured further into uncharted territory by singing on a few tracks as well, and employed the uniquely beguiling talents of guest vocalists Sarah Scott and Backini collaborator Shona Foster, who each infuse this heady brew of sounds with their own indispensable magic. An album that simply demands to be heard, '27 Devils' is an addictive listen from a major talent -full of surprises and bursting at the seams with catchy pop hits in the making. A digital download single "Hold On" featuring Sarah Scott / "Hold No Water" is out on 13th April.